This casual, twin size sleeper sofa is brought to you by one of America's leading furniture brands. The style features soft, casual design elements that will help you to create a serene look in your living room or family room. An easy to lift sleeper mechanism allows you to quickly turn this sofa into a bed so that you can easily accommodate overnight guests. 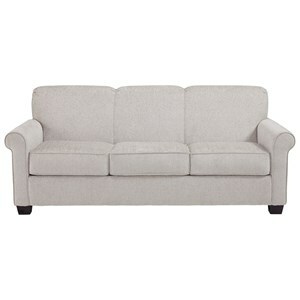 This couch is complete with tapered legs and welt cord trim for a tailored look. This sleeper sofa is available in a twin size, full size and queen size option. The Cansler Twin Sleeper Sofa with Casual Style by Signature Design by Ashley at VanDrie Home Furnishings in the Cadillac, Traverse City, Big Rapids, Houghton Lake and Northern Michigan area. Product availability may vary. Contact us for the most current availability on this product. Padding & Ergonomics Cushions are constructed of low melt fiber wrapped over high quality foam. Seat cushions are removable. Pull-Out Mattress Memory foam mattress. Mattress Size 33.00" x 72.00" x 4.25"
Find a perfect sofa sleeper for wherever you may need it within your home with this collection. Choose from three sizes and two fabric choices. The Cansler collection is a great option if you are looking for Casual furniture in the Cadillac, Traverse City, Big Rapids, Houghton Lake and Northern Michigan area. Browse other items in the Cansler collection from VanDrie Home Furnishings in the Cadillac, Traverse City, Big Rapids, Houghton Lake and Northern Michigan area.